Whether you’re a singleton living off takeout or a mom feeding a growing family, food is something we all have to spend money on, and many of us could stand to spend less than we currently do. From the simple and easy to the somewhat extreme, here are 22 smart ways to cut your food budget down drastically. The first step to saving money on food is to think like a Boy Scout (i.e. “Be Prepared”). Setting up a monthly or weekly grocery budget will help you stay on track and keep your spending in check. Want proof? One woman managed to get by on a mere $4 a day, while another feeds her family of five for only $64 a week. They manage these feats by knowing how much they intend to spend before they ever set foot in a store and developing clever ways to make their goals happen. Planning your meals for the week enables you to shop only for the ingredients you’ll use that week, reducing food waste, cutting meal prep time and saving you from that dreaded moment in front of the fridge where you ponder what on earth you’re going to make that night. This is Savings 101, but you’d be amazed how many people skip it. You don’t need to spend hours each week clipping and organizing like the overzealous savers on Extreme Couponing; all you need is this simple, efficient system. The more you cook from scratch rather than buying premade and prepackaged convenience meals, the more you’ll save. If you don’t like cooking every night, invest in a slow cooker and make a big batch of something over the weekend, then store it to reheat over the course of the week. Brown-bagging your lunch and brewing your coffee at home will also cut back on your costs. You can save a ton by growing your own produce — but make sure you know which produce to grow, and which is actually cheaper to buy from the grocery store. Here’s a breakdown of the most and least cost-effective veggies to grow yourself. It sounds like magic, but it’s not: You can actually regrow certain vegetables you’ve already used, getting the most bang for your produce buck. Already got a garden? Take things one step further by keeping animals. You don’t have to live on a farm to raise rabbits for meat or keep chickens for eggs — all you need is a little plot of backyard for them to roam in. Tossing food in the trash is essentially throwing away money. To reduce food waste, schedule a leftovers day each week to clean out your pantry and fridge. Omelets, soups, salads and wraps are great ways to get creative with whatever odds and ends you have on hand. You can also repurpose some of the food you’d normally toss. Stale bread can be made into croutons, for instance, and past-ripe bananas are ideal for banana bread. Meat can be expensive, and there are plenty of great recipes out there that use protein substitutes like soy, tofu and beans. Whether you go totally vegetarian or plan a few meatless meals each week, you’re bound to save money (and eat healthier!). Buy fruits and veggies in season, when they’re fresh and growing locally, to save money. Buy in bulk to save even more; you can freeze them or turn them into things like applesauce, preserves and more to enjoy them throughout the year. Saving money on your groceries is one strategy, but you can also make money for the food you buy. Apps like Ibotta and Nielsen Consumer Panel and will give you cash back for the things you’d purchase anyway. Not on you — on your produce. Remove any stems, stalks and leaves before you buy to reduce the weight for items that are paid for by the pound. Even if you only remove 5% of the produce, you’re still cutting 5% off your grocery bill! When you can find an item for a great deal and you know that a) you’ll use in the future and b) it won’t expire for a long time, stock up on it. Set up some shelves in your basement to keep overflow items in a cool place. An extra freezer can help you stockpile frozen food (and enable you to save more leftovers, big-batch meals and in-season produce). You’ve heard of dumpster diving, and some of you may have even tried it for items like electronics and furniture, but have you ever considered dumpster diving for food? A close relative of freeganism, but a tad less gross-sounding, urban foragers scavenge for edible plants like weeds, mushrooms and herbs that grow throughout their neighborhoods. You can’t wander into someone’s garden and call it “foraging,” but anything growing in public parks and green spaces is up for grabs. Just do some research online beforehand to learn which plants are safe to eat and which are not. 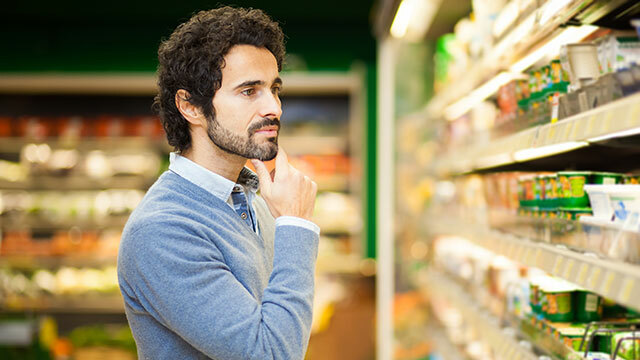 Grocery stores want you to spend as much money as possible, so learning the strategies they use to compel you to do this can help you stick to your list — and your budget. For instance, stores like to lure you into purchasing more than you intend by placing more expensive items at eye level, using end caps to grab your attention and placing staples like milk, eggs, bread and milk at the back of the store so you’re forced to pass through several aisles to get to them. In addition to being aware of general grocery store sales tactics, you can also save by knowing what day of the week your store slashes its prices and the specific tricks and tactics you can use to save there. For instance, here are some ways to save money at Target, Walmart and Whole Foods. You don’t necessarily have to throw out an item just because you’ve passed the date stamped on the package. “Sell by” simply means the date by which the store should sell an item in order to guarantee maximum freshness and taste for the consumer. “Best if used by” is also a means of ensuring best quality. If your item is a few days past its date, it should still be perfectly safe to consume so long as its appearance, smell and consistency seem normal. Think the only place you can negotiate price is at garage sales? Think again. When it comes to the deli counter and bakery department, freshness is of ultimate importance. If a clerk isn’t able to move an item before it hits its expiration date, it will be tossed and the store will lose money. If you notice any meats or baked goods that are at or close to expiration, ask to speak with a manager to see if you can get a discount for what is essentially a “clearance” item. How and where you store your food plays a big role in how long it will last (and still taste yummy). Check out sites like StillTasty to find out the best way to store your food and learn which zones in your fridge and freezer are best for keeping which items. What about those nights you decide to splurge and eat out, or your friends invite you to join them somewhere for dinner? Do a little pre-meal munching so you don’t arrive at the restaurant starving. Snack before you go and you can skip the appetizer, share an entree or just get dessert while you hang out with your friends and enjoy good company and conversation. Of course you take home your own doggy bag from restaurants (right? ), but you can also score some next-day meals by volunteering to clean up after office luncheons, school fundraisers and other events, where you snag yourself things like free slices of pizza, extra sandwiches or leftover baked goods.